How do we provide a Rebate? We are paid a referral fee when our clients lease their new apartment. Most apartment locating companies keep this commission; UMoveFree uses a portion of our referral fee to provide you a Free Move or Cash Back Rebate. To learn more about our service see How it Works. Customers with a rental rate of $900 or above are eligible to receive a $200 rebate check. Customers with a rental rate below $900 are eligible to receive a $100 rebate check. 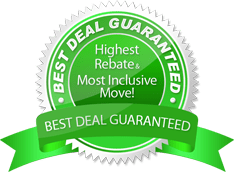 Renters that do their research know that UMoveFree has the highest and fairest rebate offer in the industry - guaranteed. Not only do our competitors offer half the amount, but their rebates often come in the form of a prepaid gift card that expires after 90 days! We cut through the scams and the gimmicks and offer the highest rebate in the industry. You'll receive a rebate check that you can deposit or cash... and spend as you please! UMoveFree offers the Highest Rebate and Most inclusive Free Move offer available. We're so confident you can't find a better deal, that if you can, we'll beat it - Guaranteed! UMoveFree is not only the largest apartment finding service in Texas; we're also the most reputable. We encourage renters to check out real reviews from real customers before choosing any free move / rebate apartment finding service. Renters that do their research on independent review sites choose UMoveFree every time. You'll find that UMoveFree has incredible customer satisfaction; something our competitors just can't say. Don't trust your belongings to smaller competitors with bad customer reviews. Browse hundreds of UMoveFree Reviews now. For complete details see our Rebate Terms page. Not interested in our Rebate options? Check out our Free Move options instead.